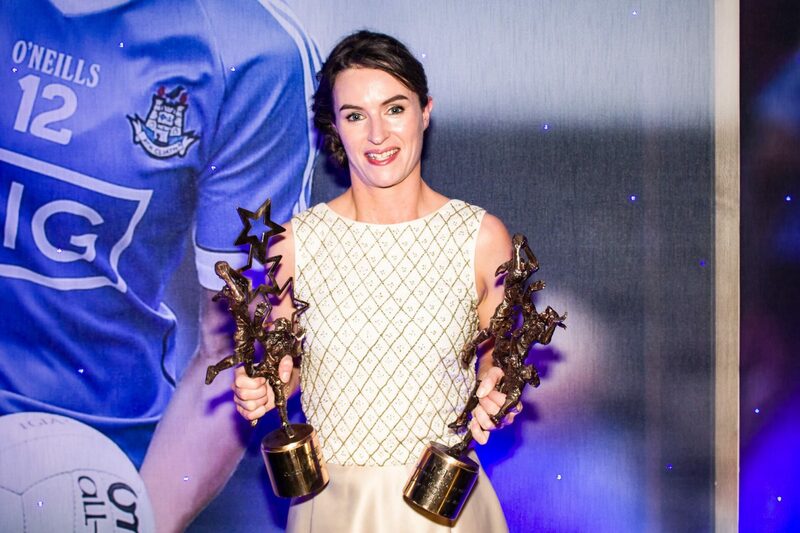 Dublin Captain Sinead Aherne with her All Star and Players’ Player Of The Year Awards At The All Stars Awards Night In The Citywest Hotel Last Saturday Night. 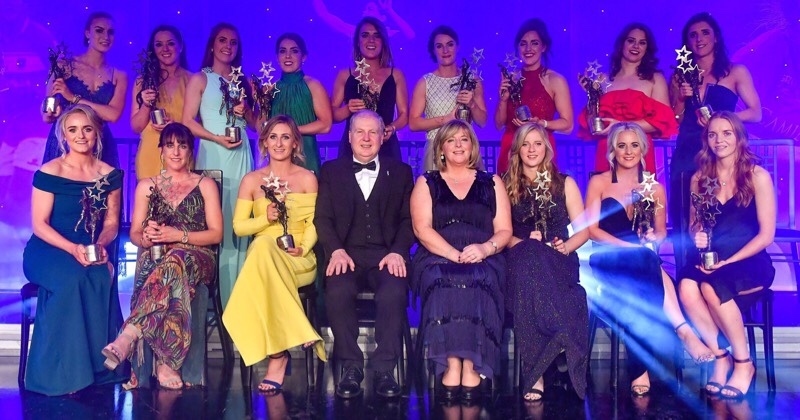 DUBLIN’S Sinéad Aherne was named as the 2018 TG4 Senior Players’ Player of the Year at the annual All Star banquet, in association with Lidl, at the Citywest Hotel on Saturday night. Aherne captained the Sky Blues to a second successive TG4 All-Ireland Senior title in front of a record 50,141 attendance at Croke Park on September 16 – and the St Sylvester’s star scored 1-7 in the Final victory over Cork. In total, Aherne bagged 5-31 in the 2018 TG4 Senior Championship, and she was the popular choice with fellow players to finally claim the coveted individual award. It was the third successive year that Aherne, 32, had been nominated for the Senior Players’ Player of the Year award. Cork’s Bríd Stack won the 2016 title, while the 2017 gong went to Aherne’s Dublin team-mate Noelle Healy. But it was very much a case of third time lucky for prolific forward Aherne, who also claimed a 7th TG4 All Star award on the night, and a third in as many years. Aherne had been nominated for the Senior Players’ Player of the Year award alongside team-mate Lyndsey Davey and Cork captain Ciara O’Sullivan. Tyrone captain Neamh Woods was another player to win on the double as she was named Intermediate Players’ Player of the Year. Woods, 29, was the choice of her peers, having been shortlisted alongside Tyrone team-mate Gemma Begley and Meath captain Niamh O’Sullivan. Drumragh player Woods skippered Tyrone to a third successive TG4 Ulster Senior title in 2018, and she lifted more silverware in September, when the Red Hands landed the All-Ireland crown. She was Player of the Match in the Final victory over Meath, scoring a goal in each half, and Woods also collected a second All Star award on Saturday night, having been previously honoured in 2008. And while Louth may have lost the TG4 All-Ireland Junior Final against Limerick at Croke Park, Wee County captain Kate Flood was voted by her peers as the TG4 Junior Players’ Player of the Year. Flood saw off stiff opposition from Limerick pair Cathy Mee, who captained the Shannonsiders to All-Ireland glory, and Rebecca Delee, who scored two goals against London in the TG4 All-Ireland semi-final, and two more in the Final on September 16. It’s the second time that Flood has won the TG4 Junior Players’ Player of the Year award, having previously claimed the individual accolade in 2015. Earlier in the evening, Waterford legend Marie Crotty was officially inducted into the Ladies Gaelic Football Association (LGFA) Hall of Fame, while Chellene Trill (Galway/Connacht), Aoife Rattigan (Kildare/Leinster), Síofra O’Shea (Kerry/Munster) and Megan Ryan (Donegal/Ulster) collected the provincial Young Player of the Year awards.